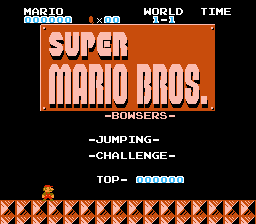 Super Mario Bros. Bowser’s Jumping Challenge is my SMB1 hack for the NES. I will be using SMB Utility, a great easy to use editor. I have also edited some graphics, nothing major. 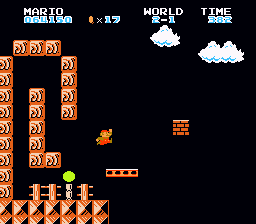 I updated the numbers’ font, mushrooms and the floor and solid block graphics to SMB3 style. 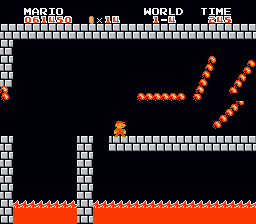 I also added some big “B”s in different places to signify Bowser’s involvement in this challenge, it is called…Bowser’s Jumping Challenge after all. This hack is hard, but real world hard…not save-state hard. Save-state hard means this game could only be beaten by save-stating in an emulator after every hole or bad guy. I think games design with that in mind aren’t true to the nature of console games, or any type of GAME. Games should be fun, if they can be challenging and fun, even better. But taking the player out the flow of a level so they can press F-whatever to save because they know the game will cheat them soon, is bad design, poor taste (if done intentionally) and just no fun for the player. So that’s why I call my hack real world hard. 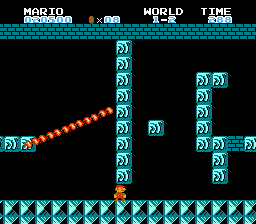 As in, if this where an actual cartridge inserted into an existing Nintendo Entertainment System, the player could actually beat the game without any artificial help. 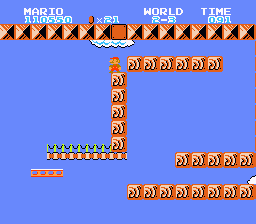 Having said all that, SMB1BJC isn’t terribly long either. Four levels per world, 3 worlds amounts to 12 levels total to complete. Short and sweet, the perfect length in my opinion. A good old-school platformer lover gamer should eat this hack up in an afternoon. I’m gonna have to assume anyone with knowledge of this site and its type knows that a game-pad is pretty much required to play these demanding of hacks. If you can beat it using a keyboard…wow.